Down a staircase fit for a king and queen! I would recommend the Emory Creek Victorian Bed & Breakfast in Branson, MO as the most romantic getaway spot I've ever been to. 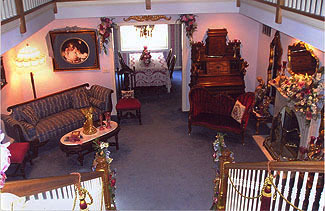 For starters, the B&B is north of town and away from the hustle and bustle that is Branson. While the house is pure Victorian in look and feel, it's actually a new facility built to look old, but with all the modern conveniences. After checking in we were taken up a grand staircase to our balcony room. It was beautiful. Done in tasteful Victorian style, it featured both a fireplace and a two-person whirlpool tub. We had ordered dipped strawberries and a cracker/cheese plate which were delivered to our room during the evening. There was a TV, but it was discreetly hidden and didn't take away any of the Victorian ambiance. In the morning while we were waiting for breakfast, one of the B&Bs owners, Sammy, who had played the piano professionally all his life played the piano for us while we sat in the lovely parlor. Then we were called to breakfast. The dining room was gorgeous, and breakfast was served on beautiful china dishes. The meal of a fabulous egg casserole and pepper bacon was superb. Even though it was only for one night, it was a fairy tale vacation for us which we'll remember all our lives. Great tip about staying on the quiet side of Branson. Check out our Missouri Babymoon Page for more babymoon getaways in Missouri.